Planning is underway for the 2019 Families Learning Conference, which will be held Nov. 4-6! This year’s Conference will bring an extra dose of excitement to attendees as NCFL will be celebrating our 30th anniversary, and bringing the conference home to Louisville, Kentucky. The mission of the Families Learning Conference is to equip educators, program staff, librarians, parent leaders, and others with best practices, strategies, and resources to help families succeed in accomplishing their educational goals. 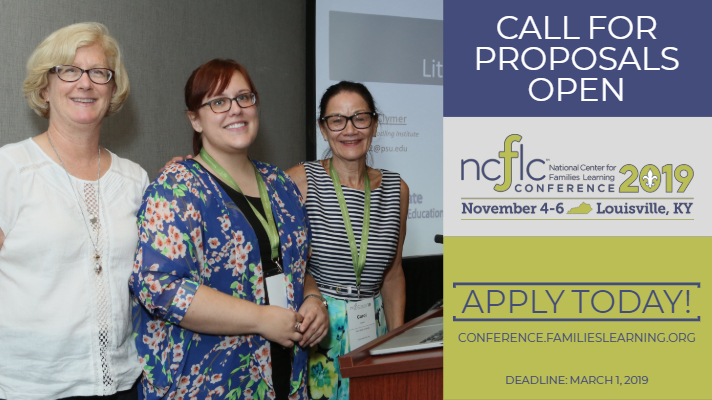 To achieve this mission, the National Center for Families Learning (NCFL) is calling on our network and peers to submit presentation proposals reflecting best practices in engaging families in education.